Cell phone maker Nokia announced Friday plans to discontinue its N-Gage, a cell phone and handheld gaming console. N-Gage services will no longer be available on new Nokia cell phones, and the online N-Gage Store itself will close in one year. The N-Gage first debuted in 2003, but an awkward design that looked more like a taco than a cell phone and limited software selection led to tepid response from consumers. 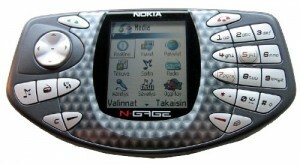 Nokia tried to refine the design with the N-Gage QD, and in 2007, Nokia rebranded N-Gage as a mobile gaming service whose functionality would be built into new, emerging cell phones. Intent on creating opportunity from adversity, Nokia points to its Ovi Store (“Ovi” means “door” in Finnish, Nokia’s native language) as an alternative for Nokia phone owners interested in buying games. Since its debut in May, 2009, the Ovi Store has been positioned as Nokia’s answer to the App Store, where Nokia phone owners can purchase and download applications for their devices, including games. Like Apple, Nokia takes 30 percent off the top of any apps sold from the Ovi Store. There can be little doubt that N-Gage’s demise was spurred by the continued success of the iPhone as a gaming platform. Tens of thousands of games are available for purchase and download from the App Store, including many developed and published by major game makers like Electronic Arts. Games comprise the single biggest segment of applications available for download for the iPhone. Nokia said that users of N-Gage equipped phones will be able to share high scores until the N-Gage store shuts down in September, 2010. Games will continue to work after that, though social networking features supported by N-Gage games will be non-functional once the store shuts down.